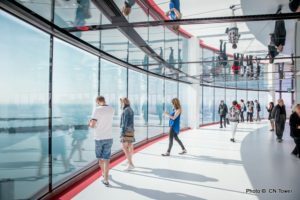 Toronto’s iconic CN Tower in downtown Toronto has unveiled the $16 million renovation of its 14,000-square-foot observation level. Designed to modernize and enhance the guest experience while providing truly universal access, the revamped observation level’s features include scalable space that can be customized to host events for up to 800 people. and three new food bistros with menus inspired by the diverse regions of Canada and featuring Canadian ingredients. In addition, the CN Tower has launched a new, free Viewfinder App for mobile devices. The app features day and night 360 degree panoramic images of Toronto and surrounding area, and allows users to identify more than 90 landmarks. It is available in five languages (English, French, Spanish, Korean and Mandarin) and is available for download at the App Store and Google Play.